● Chicken eggs – 2 PCs. ● Flour – 8 tbsp. 1. To suggest that you start with, to get the cherries from the freezer and thaw it. After removing the bone. 2. Then you need to cook the pancakes. As I have said, we will need 20 PCs. Bake pancakes is desirable in a pan with a larger diameter, because of the size of pancakes depends on the future size of the cake. 3. If you don’t like to experiment, we suggest that you batter to cook for her beloved and proven recipe. 4. I incredibly wanted to try cottage cheese pancakes. My mistake was that I previously did not find a specific recipe for their preparation, and, as usual, did everything in his own way. And, as it turned out, just a «sorry» flour. 5. But soon the process was established and it has worked. 6. So, in order to make cottage cheese pancakes, cottage cheese must grind with eggs, sugar, salt and soda. I have used this blender. 7. Then add boiling water and stir. 8. Now gradually add the flour to get the required consistency and homogeneous structure. And, of course, do not forget about the vegetable oil in the dough. 9. When it is ready, bake the traditional way our pancakes, stacking them on a pile. Advise then the pile cover with an overturned bowl for 10 minutes – the pancakes will then become soft and pliable, it will be easy to work with. 10. Next, we will prepare regular sour cream with a mixer, beat all the necessary ingredients. 11. Now take the dish, which will form the cake. 12. 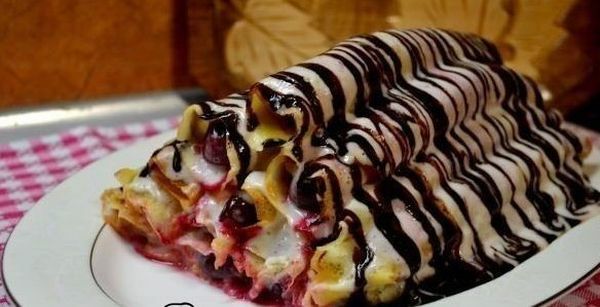 For each pancake, we put the cherries and fold into a tube. Place on a platter. 13. For the first row, we need 5 tubes – covered cream, then 4 rolls and cream, then 3 things and again cream, 2 tubes of sunscreen and put the last straw. 14. Fill our pancake hut remnants of the cream and decorate with chocolate. 15. If time permits, it is best to leave the cake for an hour or two for impregnation. It turns out incredibly tasty and juicy dessert!